SEM’s self-propelled coating and wrapping machines apply a single dope coat and a single or double wrap of paper or fiber to pipe. 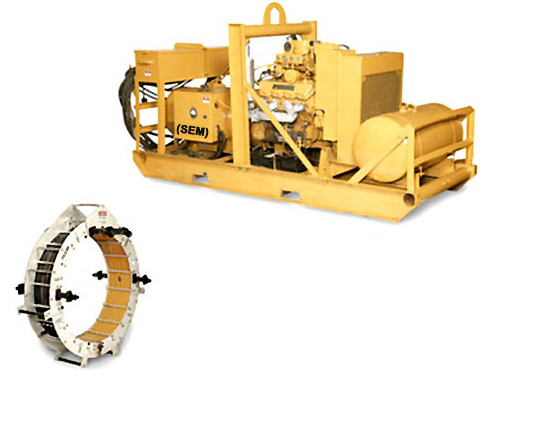 These ruggedly built and self-contained machines can coat and wrap pipe from 6 to 42 inches (15.2 0 106.7 cm) in diameter. SEM’s Clean, Prime and Tape Machine is self propelled to perform the complete operation of cleaning, priming and wrapping pipe from 2 to 42 inches (5-106.7 cm) in diameter. The PROLINE designed counter-rotating cleaning heads, utilize a combination of brushes, cutters or knives, easily cleaning bends, sags and weld of the pipe. 360º spray rings for even distribution of primer. P.I.V. transmission enables the operator to simultaneously change machine speed and adjust the tape lap without stopping the machine. Available in seven models for different size of pipe. Optional mountain climber assembly for added tractor on steep grades.